I thought I was pretty good with not buying books this month, but hey, who am I trying to kid? 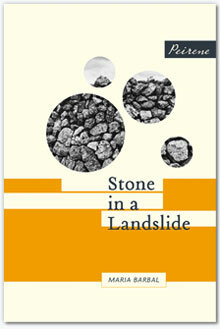 Stone in a Landslide by Maria Barbal – the lovely Meike from Peirene Press sent this for me to try. I’ve never read any Catalan fiction and Stone in Landslide has been in print for 50 years, but this is the first time it’s been translated into English. 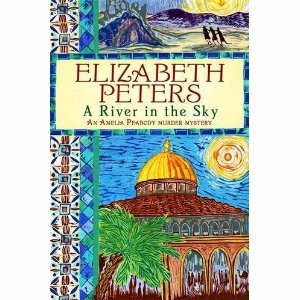 A River in the Sky by Elizabeth Peters – the newest addition to Peters’ Amelia Peabody series. I fell in love with the series set in the early 20th century that combine mystery, history and Egyptology with some incredibly wonderful and funny characters when I picked up the first volume Crocodile on the Sandbank at Chicago’s famous Seminary Co-op Bookstore (astrophysicist and my hero Subrahmanyan Chandrasekhar’s favourite bookshop) years ago. She’s one of my favourite writers and I always return to her when I’m in need of some bookish comfort. And Amelia’s son Ramses is to die for. Leave Me Alone, I’m Reading by Maureen Corrigan – How could I not pick this up? The title alone hooked me. Solo by Rana Dasgupta – Dasgupta was present at the GLF 2010 earlier this year, but I hadn’t read any of his books although Tokyo Cancelled has been on my radar. Solo won the Commonwealth Writers Prize this year. The Gunslinger by Stephen King – I’ve heard so many good things about King’s The Dark Tower sequence of which this is the first book. I found this book just after reading a great review about the series. It’s funny how these things happen. And The Dark Tower books are fabulous. I hope you enjoy them! Stone in a Landslide sounds great, I’m interested to see your review. Also, I wouldn’t be able to walk by Leave Me Alone, I’m Reading either. What a great title! Sakura, I’ve been planning to pick up and Eizabeth Peters for a while now but haven’t got round to it yet even thought I’m pretty sure I would love her books. Is Crocodile on the Sandbank the first one in the series of Amelia Peabody? I saw that one in the library last week so I could get it from there. Teresa: Yes, it is the language book. And I’m looking for to reading The Gunslinger – it’s completely different to the books I usually read. amymckie: I know, the subtitle is Finding and Losing myself in Books! The Book Whisperer: Yes it is. I really recommend it. It’s light, funny and you learn a lot about Egyptology from an actual expert. I can’t vouch for the rest but The Gunslinger is very good. Not usually what I read either but thoroughly enjoyed be warned though it is a long series! I have one more to go now! I’ve had the first few Amelia Peabody books in my tbr pile for ages – I should get to them sooner rather than later. Enjoy your new acquisitions! Thanks for the highlights! I have taken a note of Solo and Leave me alone I’m Reading. Lets hope my library has them. Just finished my first Sarah Waters The Little Stranger and I hated it to finish!!! Stone in a Landslide sounds like a very interesting book, I hope you enjoy reading it (and make putting it on my wishlist more legitimate :)). I’ve been meaning to get “Modern Tongue” by Bryson for a while now. jessicabookworm: Wow, it’s seven books isn’t it? And the first volume is the slimmest! Nymeth: Definitely! Once you start you won’t be able to stop! Mystica: I’m so happy you liked Sarah Waters. She’s brilliant. Can’t wait to read your review. Iris: I’m halfway and liking what I’m reading. I had Bryson’s book on my wishlist for ages as well. I love reading about the English language and where all the words originate. Yeah its 7 books which get bigger and bigger. I only have the last one which is a beast of a book…I’m actually a little daunted by it!